In America, anyone can grow up to become president. At least, that’s what we were taught in school. The reality is a little more complicated. It turns out that if you want the office, it really, really helps to be related to someone who has already held the office. 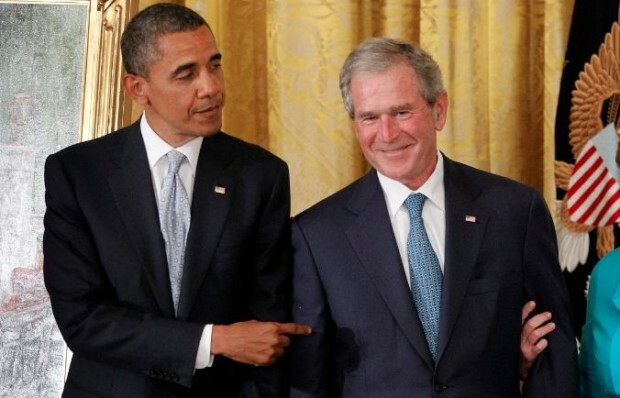 Even Barack Obama is 11th cousin to both the Georges Bush, according to noted genealogist Gary Boyd Roberts, who has studied such things and written the book Ancestors of American Presidents. Certainly, 11th cousin is a little too distant to be meaningful — at that distance, an amazing number of people are related to everyone. It turns out that if you carry it all back far enough, every American president except Rutherford B. Hayes is ultimately descended from Alfred the Great. But then, you might be, too. I don’t know why Hayes misses out. But we don’t have to go that deep into genealogical minusculae to realize that having a relative in the Oval Office helps: Four presidents are father-son (Bushes and Adamses), two more are grandfather-grandson (William Henry and Benjamin Harrison). Just at that level of connectedness, that means that just under 14 percent of our chief executives are related to other chief executives. That is already statistically significant. If you add the Roosevelts, that number jumps up to just under 20 percent. Nearly one in five of our presidents is closely related to another president. But it doesn’t end there. James Madison was second cousin to Zachary Taylor. At the third-cousin level, Martin Van Buren claims the Roosevelts, John Adams adds Calvin Coolidge. That raises the percentage up to just a hair under 30 percent. Beyond that, at the fourth-cousin level, you have to include John Tyler and the Harrisons, Ulysses Grant and the Roosevelts (and Van Buren), Zachary Taylor and the Roosevelts, James Garfield and the Bushes, Franklin Pierce and Herbert Hoover, Millard Fillmore and the Adamses, Calvin Coolidge and the Adamses, William Howard Taft and the Adamses. Everyone seems to be related to the Adamses. The presidency is in some respect an Adams Family thing. If we count all the fourth cousins, that means that 43 percent of American presidents are related to other presidents. The myth tells us that the common man is king in America, the reality is that America has its own sort of aristocracy: Those in power tend to be born of those who held power before them. Kind of like a legacy admission to Yale or Harvard. Beyond fourth cousin, the connections become admittedly more tenuous, But there are other notable relationships that might be mentioned: Hoover and Richard Nixon, both Quakers and distantly related, Nixon and Jimmy Carter, Nixon and Gerald Ford. Ford is an instructive case: The simplest and folksiest of recent presidents is in some ways the best connected. He is distantly related to Franklin Roosevelt, Abraham Lincoln, Millard Fillmore, Garfield, Hayes, Taft and Coolidge. He is also related to George W. Bush. George W. Bush, in turn, is related to Pierce, Garfield, Hoover, Fillmore, Taft, Grant and Nixon — and, of course, George Herbert Walker Bush — not exactly the most illustrious line of presidents, and several who have been considered at the bottom of the barrel. Admittedly, many of these more distant relationships are slender, at best. But if you count everyone down to 10th cousin among this presidential inbreeding, you come up with the astonishing figure that 61 percent of our presidents are related to other presidents. And that doesn’t count such things as: George Washington’s half aunt married James Madison’s half first-cousin, once removed, or that Woodrow Wilson’s second wife was the great-great-great-niece of Thomas Jefferson. So, it’s not just who you know, but who you’re related to.